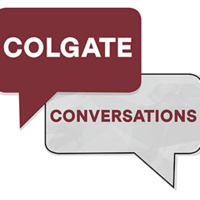 Colgate Conversations: "Art and Conflict: A Conversation with Dawn Weleski"
Colgate AAH Professor Margaretha Haughwout and visiting artist Dawn Weleski* will lead a group dialogue about social issues of importance to Colgate students, faculty, and staff, and how art may be used to address them constructively. *Pittsburgh-based artist Dawn Weleski’s practice administers a political stress test, antagonizing routine cultural behavior by re-purposing underground brawls, revolutionary protests, and political offices as transformative social stages. Recent projects include "The Black Draft," a live mock sports draft during which ten Black former Pittsburghers, from all professions, are drafted to return home, and "City Council Wrestling," a series of public wrestling matches where citizens, pro-am wrestlers, and city council members personified their political passions into wrestling characters. She co-founded and co- directed Conflict Kitchen, a take-out restaurant that serves cuisine from countries with which the U.S. government is in conflict, which has been covered by over 750 international media and news outlets worldwide.